The plot: Continuing after the events of Godzilla 1985, Japan begins coming up with a way to get rid of the monster. (This is part of the second series of movies that ignores the original series except for the first one.) Meanwhile, a scientist working on a way to use Godzilla’s cells to enhance plant life appears to abandon his work when his daughter is killed in a bombing. Instead he is working on keeping his daughter’s spirit alive though a new plant and no, I have no idea how that works. Brought into these events is teen psychic Miki Saegusa (Megumi Odaka), who will go on to be a recurring character in the second series of Godzilla films. 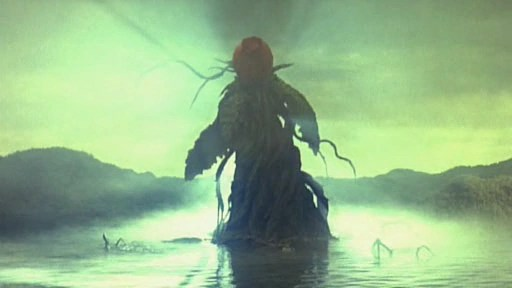 She is not only able to mentally link to Godzilla but also the professor’s plant after it too evolves into a monster called Biollante. Japan must decide the lesser of two evils and hope their modified Super X plane (first scene in Godzilla 1985) will be enough in the next battle. While the classic Godzilla movies are my favorites it’s part nostalgia and part fun. I do have to admit, however, that the second series is probably the best of the three series of films. There’s a lot more effort here when it comes to monster designs and of course the special effects have improved. Miniatures and costumes are still used, and it shouldn’t be any other way. This is one of Godzilla’s strong points, although there are many that disagree. Computer imagery versus rubber suits is an ongoing debate. Personally, I’m on the suit side because there’s a physical presence you don’t always get with CGI. Pre-Monster Biollante. Somebody overdosed on Miracle Grow. One of the big improvements in editing is slowing down the footage to make Godzilla look more massive and lumbering than before. It’s a nice effect that you can see in action in the special features. The miniatures, from vehicles to sets (the “MASER” cannons make their return) have improved, most noticeably the city sets. I guess with neon lights and jumbotrons they kind of have to. The monster fight with Godzilla and Biollante aren’t bad but you can tell they haven’t done one of these in a while. The costumes and the prop for Biollante’s early form both look menacing and the editing between the costume/prop footage and the live-action people scenes are more smoothly so it looks like they’re in the same spot. Only on occasion was it so obvious they weren’t that I noticed. The special features are minor but a good addition. One looks at the filming of the movie and the other designing the new monster and updating the Super X plane. There are also three audio tracks: two Japanese language tracks (in 5.1 and 2.0 surround sound) and one English (1.0 Dolby, which is kind of disappointing for people with theater surround sound systems in their house). I’m told that the full Japanese subtitles aren’t that good but I watched this in English using only the “translate signs” subtitles. There’s also English subtitles matching the English track for the hearing impaired. This is a darn good Godzilla movie and shows how far they’ve advanced in the years since their last Godzilla movie. The story has its faults but none that, at least for me, detract from enjoying the film, although it is a product of it’s time in a few spots. 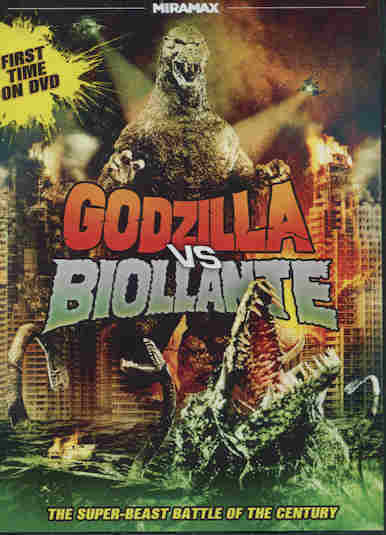 Godzilla Vs. Biollatne is worth a look and at the price this 2011 release goes for (a friend of mine found it at a different store for the same price) you can’t go wrong if you just want a relaxing monster film but thought the classic movies were a bit too goofy near the end. The King of the Monsters was back and true to form. And getting the DVD cleaned up some shelf space. It’s a win in my book.